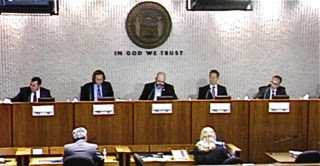 The Costa Mesa Planning Commission meets for the first time in a month for a meeting that should get everyone home early on Monday. You can read the agenda, HERE, for the meeting that begins in City Council Chambers at 6:00 p.m. While such segments are very unusual for the Planning Commission, I'm happy to see that a presentation is scheduled early in the meeting to recognize former Planning Commissioners Rob Dickson, Jeff Mathews, Colin McCarthy and Tim Sesler, shown above with current Chairman Stephan Andranian. While I often disagreed with those four men as a group and as individuals, one cannot deny their service to our community. It's completely appropriate to recognize them for that contribution. There are three (3) public hearings on the agenda. Item #1, HERE, is the two-year review of the Pacific Arts Plaza (formerly Two Town Center) development agreement. This one shouldn't take long, even if the new commissioners have questions. Public Hearing #2, HERE, is yet another small lot ordinance project at 245 Knox Place at the corner of Westminster Avenue, replacing an existing single story residence and a detached garage with two two-story residences. The project appears to comply with all codes. 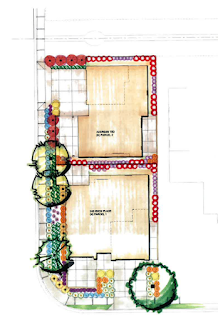 Public Hearing #3, HERE, is one more small lot ordinance project at 1933 Church Street. 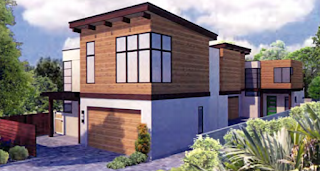 This proposal will replace a single story residence and detached garage with two two-story residences. It appears to meet all codes and asks for no variances. Permit me an observation... Since the City Council has recently opted to exclude the Planning Commission from the review of the dammed-up Sober Living Home appeals and applications, this group will find itself with much less to do than anticipated over the next few months. That decision was a mistake, in my opinion. This commission is the appropriate body to be the first stop in the appeal process and the City Council is going to find itself buried in those issues for the next few months. Sorry, Geoff, but the last PC served the RIGmeister, not our community.